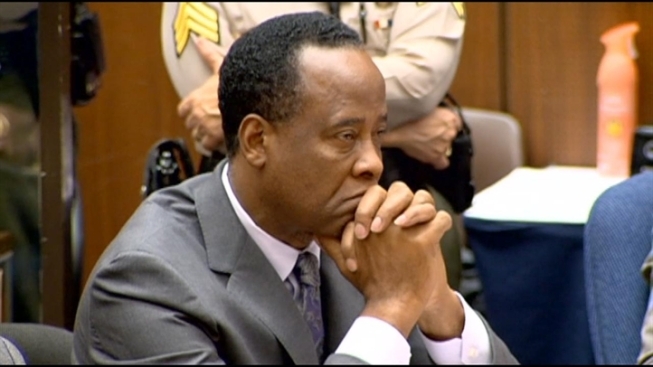 A judge calls Dr. Conrad Murray a "disgrace to the medical profession"
The doctor convicted of involuntary manslaughter in the death of pop star Michael Jackson was sentenced Tuesday to the maximum four years behind bars, but sheriff's officials said Dr. Conrad Murray will probably end up serving about two years because of state sentencing laws. Murray's sentence was handed down during an emotional hearing that included a statement from the superstar's family. Murray was convicted Nov. 7 in the King of Pop's June 25, 2009 death after a six-week trial that included dramatic recollections of the day Jackson died. That testimony included several witnesses who characterized Murray as acting in his own self-interest -- not the interests of his famous patient. "Dr. Murray engaged in a recurring pattern of deceit, of lies and that pattern was to assist Dr. Murray," said Judge Michael Pastor, who handed down the sentence after hearing arguments from attorneys. "It is almost inconceivable that Dr. Murray would have persisted in this pattern over a period of time." The doctor (booking photo, right) sat with his hands folded as the sentence was read. "It's the maximum, the judge was fair," said Jackson's mother, Katherine, outside of court. "Thank you fans, thank you very much." Murray told investigators that he gave Jackson the powerful sedative propofol -- usually administered in a surgical setting -- after the superstar repeatedly asked him for something to help him sleep after a concert rehearsal. Murray's term will be served in an LA County lockup, District Attorney Steve Cooley said after the sentencing hearing. A change in California law - AB 109 -- requires Murray to serve the sentence in jail instead of overcrowded state prisons. Murray's sentence is automatically being cut in half because of state laws, said sheriff's spokesman Steve Whitmore. He will be housed in a one-person cell and kept away from other prisoners. When asked whether justice was served, Jackson sister La Toya said, "It wasn't enough." Jackson family members, including mother Katherine and siblings LaToya, Jermaine, Randy and Rebbie, were at the proceedings. Jackson family lawyer Brian Panish was the first to address the court during Tuesday's hearing. "We are not here to seek revenge," Panish said, reading a family statement. "There is nothing you can do today that will bring Michael back. "We will keep the love in our hearts. We respectfully request that you impose a sentence that reminds physicians that they cannot sell their services to the highest bidder." "The maximum is not enough," Jackson's brother Jermaine said on his way into the courtroom Tuesday. Murray's defense will probably appeal his conviction. The 58-year-old Houston-based cardiologist has been at the Twin Towers Correctional Facility since his conviction. During their presentation Tuesday, prosecutors recalled trial testimony that characterized Murray as acting in his own self-interest with disregard for his patient. "At the point Dr. Murray knew his actions caused the death of Michael Jackson, he didn't immediately begin to cure the situation," said Deputy District Attorney David Walgren. "He started looking out for himself. He started cleaning up the room. He waited 20 minutes to have some one call 911. He then lied repeatedly. "He did not even give the family the answers they deserved." Pastor agreed, adding that although Murray was eligible for probation, he is "not suitable for probation." In addition to time in custody, the prosecution also sought restitution of more than $100 million on behalf of Jackson’s three children. Walgren noted that Jackson would have earned an estimated $100 million for 50 London concerts during the scheduled “This Is It” tour. The restitution amount will be determined at a Jan. 23 hearing. "The people are under no illusion that Dr. Murray has the ability to pay $100 million, but the people are under the obligation to seek restitution," Walgren said. Murray's attorneys presented letters of support from his mother and 33 other people. He was described as a self-made man who was active in charitable work. "I wonder to what extent the court considers the entirety of a man's book of life as opposed to just one chapter," defense attorney Ed Chernoff said Tuesday. "Michael Jackson was a drug seeker. He sought it out from Dr. Murray, who was wrong in providing it." Chernoff also asked the court to consider Murray's life before he became a personal physician for one of the world's most famous entertainers. "Whether he's a greeter at Walmart or a barista, Dr. Murray is always going to be the man who killed Michael Jackson -- that's who he is now," Chernoff said. "You listened to two witnesses say straight out, they wouldn't be alive without him. Does any of that matter?" During an NBC interview before his conviction, Murray denied that he did anything wrong. Walgren asked the court to consider those statements an indication that Murray feels no remorse. “I don’t feel guilty because I didn’t do anything wrong,” Murray said in the interview. Jurors convicted Murray after hearing testimony from nearly 50 witnesses, who included medical experts, paramedics who responded to the rented Holmby Hills mansion on the day Jackson died, emergency room staff and detectives. Prosecutors also played for jurors a recording of Jackson as he described for Murray his ambition to please his fans during a series of planned London concerts. Pastor called the recording, taken from Murray's phone, one of the most compelling pieces of evidence in his decision. "I can't imagine that happening to any of us because of the horrific violation of trust," Pastor said of Murray's decision to record Jackson, whose voice is slow, slurred and almost unintelligible. "That tape recording was Dr. Murray's insurance policy. It was designed to record his patient surreptitiously at that patient's most vulnerable point." Some of the most damaging testimony against Murray came from the prosecution's propofol expert, who said were it not for the doctor's critical mistakes, Jackson would be alive today. Prosecutors compared Murray's treatment of Jackson to a "pharmaceutical experiment" with a lack of proper monitoring equipment. He was followed on the stand by the defense's propofol expert, who also testified that Murray deviated from the standard of care, testifying that he has never heard of someone adminstering propofol in a bedroom.